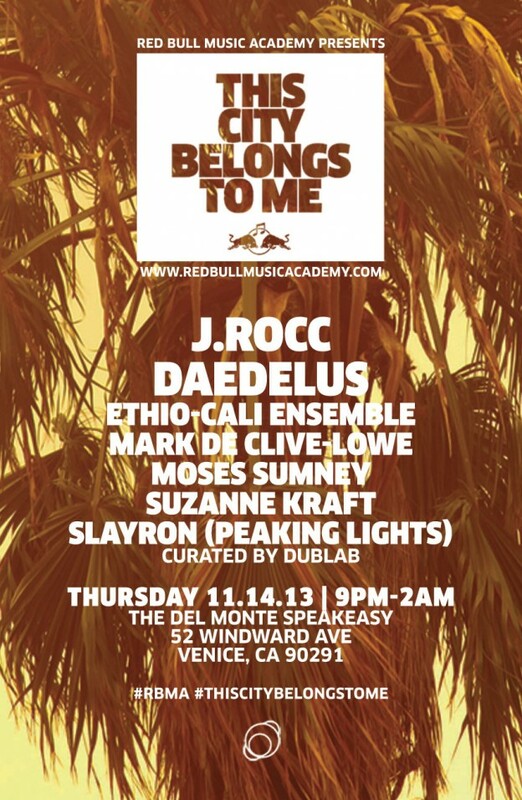 Red Bull Music Academy presents This City Belongs to Me is a new monthly event series in 2013. Every month a different venue in Los Angeles will be taken over by artists comprised of Red Bull Music Academy alumni and lecturers. In collaboration with some of the finest record labels and creatives that Los Angeles has to offer, it will be a unique night of amazing music. Join dublab and friends as they take over The Del Monte Speakeasy & The Townhouse in Venice on Thursday, November 14th. Live screen printing by HIT+RUN. Entrance with RSVP to eventbrite link only. dublab is a community supported, non-profit web radio station celebrating 14 years of elevated vibrations. We rely upon listener contributions to achieve our positive music mission. This installment of This City Belongs to me helps support dublab’s Fall 2013Proton Drive Fundraiser which is happening November 4-25. We are broadcasting live 8am-8pm PST each weekday to inspire your support. Visit dublab.com to listen to the live fundraiser broadcasts and give a generous tax-deductible donation.